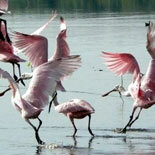 Fort Myers is a popular tourist destination with great beaches, shops, eateries and galleries. When visiting the City of Palms, consider these top family attractions. Fort Myers Beach is a beautiful gulf shore beach with a variety of amenities and recreational activities. Situated on a seven-mile-long barrier island, the white sandy beaches are a haven for watersports enthusiasts. You can swim, parasail or ride a personal watercraft. 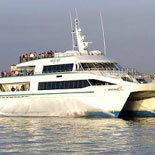 Other popular activities include fishing charters and dolphin-watching cruises. Key West, the southernmost tip of the continental United States, is a lush, tropical haven of free spirits and island charm. In Key West there is always a party going on somewhere, and it does not take too long to find it. The vibrant atmosphere and rich literary history make Key West an American original. Spend your day in Key West shopping or bar hopping on Duval Street. Visit the Ernest Hemingway house, or simply find a chair on Smathers Beach and soak up those tropical rays. However, before you set foot on the beach or belly-up to the bar at Sloppy Joes, you have to get to the Keys. The Fort Myers to Key West Ferry is a one-way service that will have you starting the party long before you get to Duval Street.